I got this wrap on my Black Friday shopping adventure with Carylee. Capes, ponchos, wraps, and the likes have been one of those items I see other people wear and think "how cute! ", but they've always been a little out of my comfort zone. With a little fashion encouragement from Carylee, I took the plunge into the sweaters-without-sleeves world. My goodness I've been missing out. 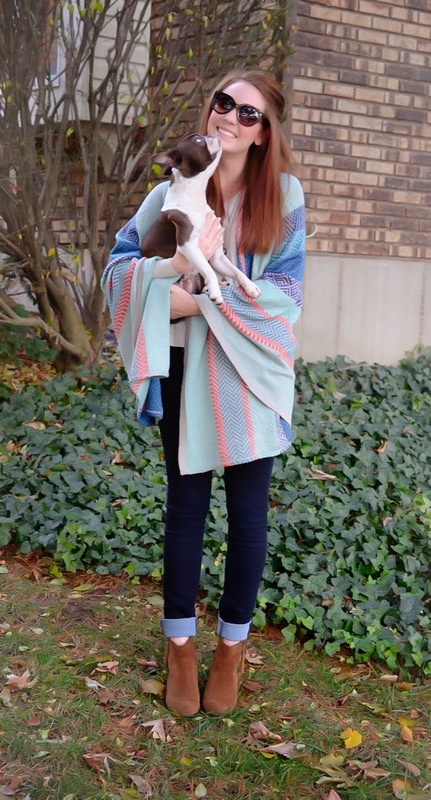 Wraps are like wearing a blanket out of your house, but socially acceptable, and far more stylish. I approve. In order to keep the look from being too shapeless or frumpy, I went with a very skinny jean, a v-neck sweater, and a small heel. I have big plans to belt this wrap over a navy dress as well. So many possibilities! I like the wrap. The colors are nice and it looks so comfy. That looks like a very cozy yet so stylish wrap - and the color is fab!!! LOVE that sweater wrap!! Super cute! 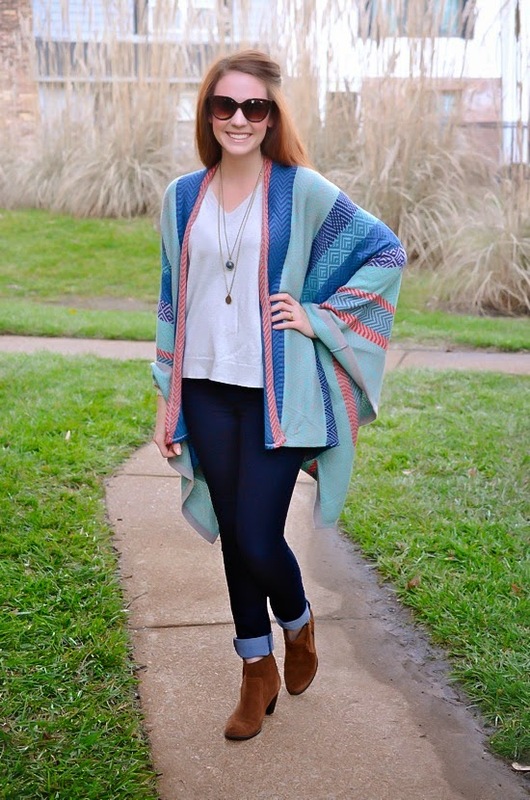 What a great wrap - love the colors and your necklace goes perfectly with this outfit. 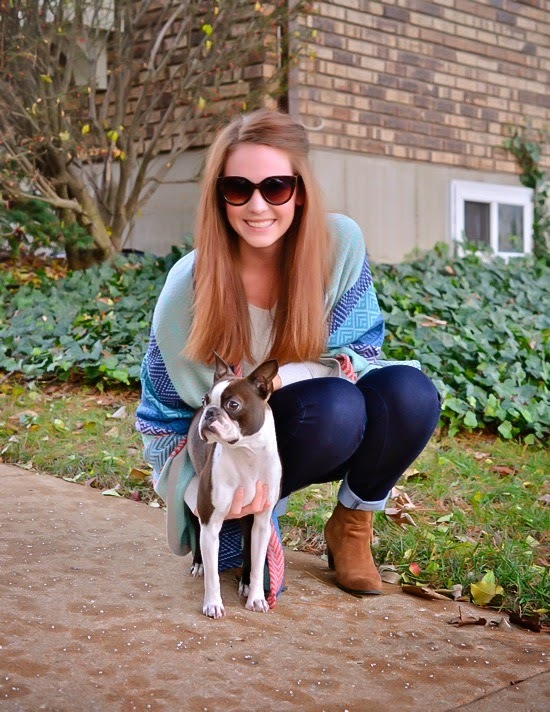 Hope to see you for TBT Fashion link up & enter for a blanket scarf & an amazing mascara giveaway. What a gorgeous wrap sweater, looks so cozy too! What a cute sweater wrap! Love the colors! Such a cozy look! I am in love with your wrap! Such a great outfit! 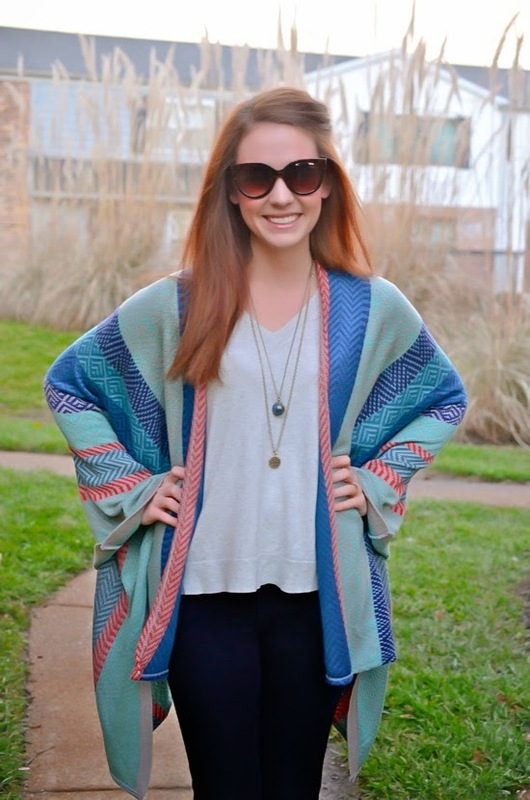 That wrap/cardi/kimono thing is divine! Love that! This is such a cute cape! I love how you styled it too, those booties are perfect with it!! Love your poncho! 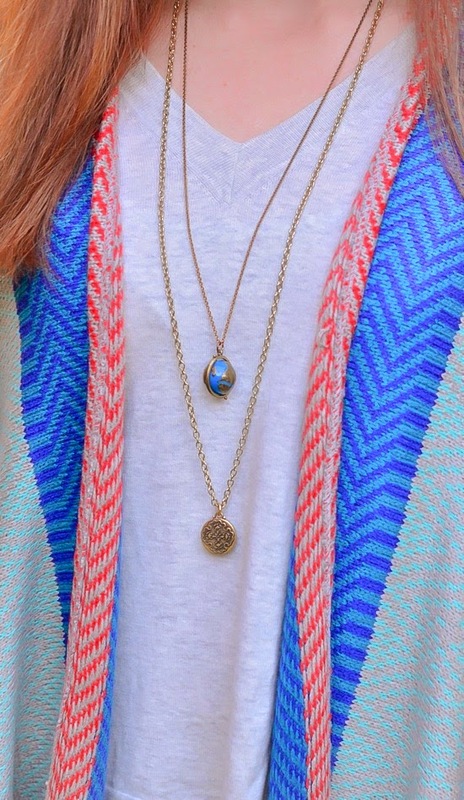 The colors are really great on you, especially paired with the necklaces! Love your doggy too! I grew up with Boston Terriers, so cute. That's such a beautiful poncho. Loving the colors and print so much! Enter the $650 EXPRESS Giveaway!! I love that sweater wrap! It looks totally cozy and warm but you styled it to make it look so put-together too. I think I need one! Cute wrap, I love the colors! Paige jeans are the best, I love how you cuffed them with the booties! What a great wrap! I love the colours in it. And it looks so warm and cozy! Great necklace too. I love those booties! Your pup is adorable! 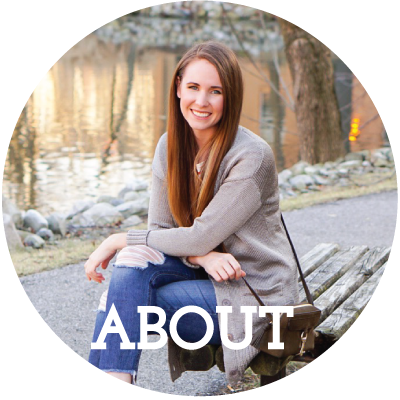 I had my kitten in my blog picture today! Fur babies make great accessories! I'm with you on capes and ponchos - cute, and I love the idea of essentially wearing a blanket - but never sure about them actually on me. Your outfit is perfect though! 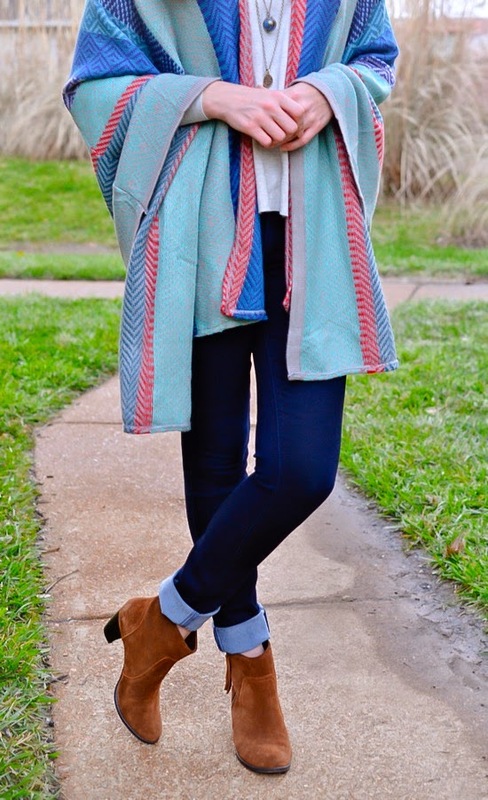 Such a great pattern/color palette, and I love how the rest of the outfit is simple with the jeans + boots. It's a great silhouette on you!